Petersburg, VA — It’s a family affair for the City of Petersburg and surrounding areas! The City does outstanding with rallying around community. Whether you’re a local, new in town, or just passing through, you’ll be sure to find a vendor with your favorite thing or hear your favorite song played by DJ C or witness a hand raising performance on The Greater Works Stage at The Greater Works Christian Fellowship Citywide Praise Family Fun Day on Saturday, August 26, 2017! The Greater Works Christian Fellowship (GWCF) will be hosting Petersburg’s very first Citywide Praise Family Fun Day on Saturday, August 26, 2017! Grab your lawn chairs, your blankets, your neighbors, your children and your church–Join me on the green at Greater Works Christian Fellowship, 801 South Adams Street, Petersburg, Virginia 23805. Remember where the old Southside Regional Medical Center and Petersburg General Hospital used to be located? That’s where we are now-right there! Do you want to grow your business or increase awareness of resources you offer? We are calling on all food, children entertainers, retail, service and resource vendors to spread across the acres of land surrounding Greater Works Christian Fellowship, 801 South Adams Street, Petersburg, Virginia 23805. Submit the Vendor Request Form-it only takes about 3 minutes to complete. Are you a praise dancer or mime artist? 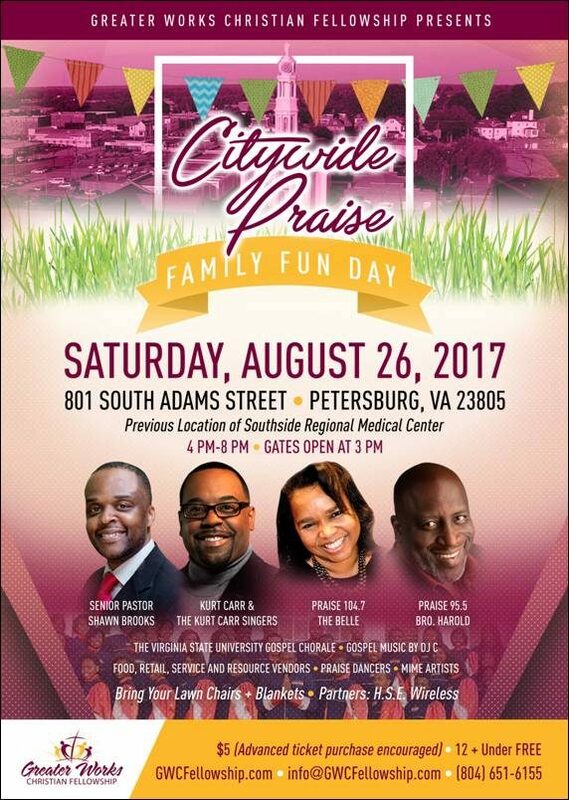 Submit the Talent Application to perform LIVE at GWCF Citywide Praise Family Fun Day on Saturday, August 26, 2017! Register for GWCF Gospel Music Workshop and Audition with Kurt Carr on Friday, August 25, 2017 for a chance to perform LIVE with Kurt Carr and The Kurt Carr Singers! Want to get involved or partner? Give me a call at (804) 651-6155 or send me an e-mail to info@gwcfellowship.com.